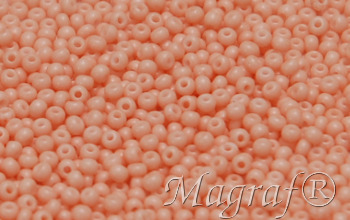 PRECIOSA Rocailles, Traditional Czech Glass Beads, color 03185 - Chalk - Solgel Dyed. Size 2,1 mm - 11/0, size tolerance 2,0 - 2,2 mm. Used in making jewelry, necklaces, bracelets, earrings, decorating garments, bags, belts, shoes, flower bouquets, production of Christmas decorations and other decorations. DIY.